We are derived from a group of smart, like-minded folks who always want more from ourselves and know that hard work and dedication are the keys to getting just that. Our coaches, our facility and our clients all show our personality as a gym. Come in, talk to the coaches and the clients there and you’ll know. Our members are our lifeblood and without them we wouldn’t exist. So when you come in, let us know what we can do for you in order to make your life a better life. At Forge Fitness, we program and coach our members so that they are healthy & strong. Being strong is the cornerstone of fitness because it allows everything that comes after it to be exponentially easier. Prior to being strong though; one must be able to move properly. That is the heavy focus in our Forged Foundations Program. There you will learn how to move; and then we will get you strong. Want to know more about our Programming Philosophy? Quick answer; anyone who is willing to put the time in with us. By that we mean that; if you have a pulse, are willing to work hard and have a good sense of humor; you’ll be just fine with us at Forge Fitness. It doesn’t matter how big/small, short or tall you are or how old you ‘think’ you are; we’ll work with you! 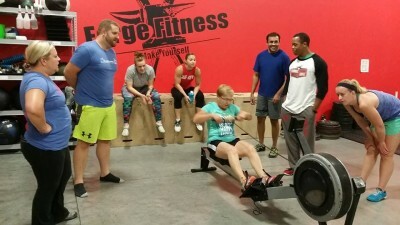 We are a small gym, full of regular folks that are trying to better ourselves. We’re medical professionals, engineers, students, business men & women, mothers, fathers, sons & daughters.